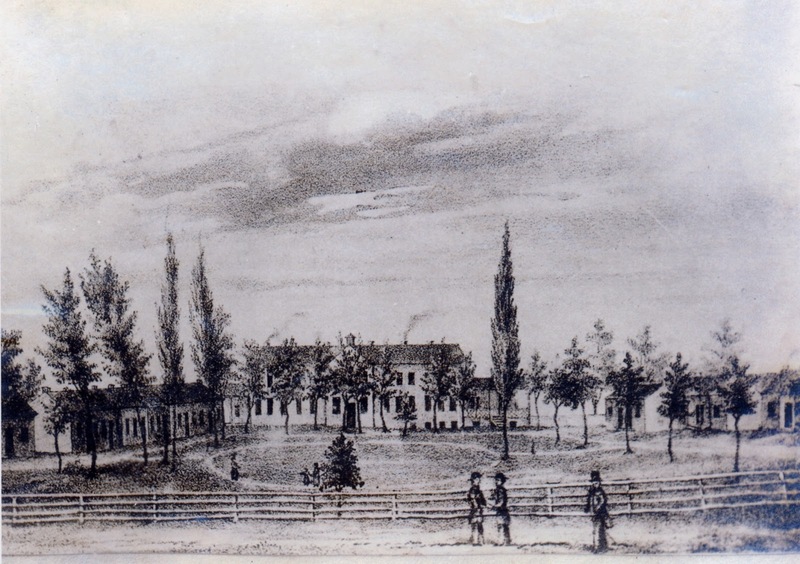 [Edward William Johnston, RULES OF THE ROANOKE FEMALE SEMINARY(1839). An original copy (scanned images) of this circular can be found at Hollins Digital Commons, Hollins University, here; and in Box 1, John Warfield Johnston Papers, 1778-1890, David M. Rubenstein Rare Book & Manuscript Library, Duke University. A transcribed version can be found here: "Notes on Hollins College," The William and Mary Quarterly, Volume 9, Number 4 (October 1929), pages 330-332]. Board, including Washing, Lights and Fuel, $100 for the Session of 10 Months. Tuition, in the Regular Course, (English and French, or Italian) $50. Music, Piano, Guitar, or Harp, $50, including the use of Instruments. Of these Fees, $100 payable on entrance: the remainder, at the end of 5 Months. Bedding will be furnished, at 50 cents per month. Dress, For Winter, Bottle-green Circassian or Merino, with Capes of the same. For those below 12 years, Pantalets like the dress. Two suits are sufficient. Pupils should bring each a Table Spoon, Tea Spoon, 6 common Towels, and as many of each article of Dress, except frocks and under-frocks; 2 pair each good Leather, and neat Morocco Shoes; Bonnet of Cane or Straw, Nun's pattern, trimmed with Crimson Ribbon. Embroideries not permitted, unless worked, in the School, by the Pupil herself. Jewelry forbidden. The Principal feels it necessary, at no matter what hazard of offending, to point out certain prevailing faults, that strongly impede the course of all good Instruction. An excellent spirit exists of giving to children every advantage attainable through Schools. Expense is not spared. Of Money, and of solicitude to bestow whatever Money can procure, Parents are lavish. But of that Domestic Care and those Early Influences, to so great a degree, determine the value of of all subsequent Education, they are generally any thing but liberal. Around the child, every thing should be assembled, that can advantageously direct its first impressions. It must have learnt to respect and obey its Parents; or it never will its Teacher, until, with infinite pains, her forms it anew. It must have seen habits of Mental Cultivation at home, and breathed something of the atmosphere of Knowledge; or study will be hateful to it abroad. It must have known something of Restraint, have been corrected of every wrong wish, every false desire; or how should it love the labours and the restrictions inevitable in a well-conducted School? If nothing but injudicious Fondness has been practised at home; it, no habits but of Self-Will, of Idleness, of Indifference to Excellence, of disregard for every thing but Frivolity and Folly have been formed --- (and such is now widely the fact) --- the Teacher, no matter how solicitous to do all that should be done, must generally fail of any very high result. That Schools, in a word, may be able to effect any thing of uniform, any thing of certain good, it is necessary that there be a Reform, in that which precedes them --- the Domestic Education and Government. These are now defective, in the extreme. The general laxity of Parental Discipline has grown to be such, and such the Disorders which it has engendered, that people can neither endure the faults of their children, nor the measures necessary to correct them. Instead of that Patriarchal role, which formerly held families in order, there reigns a Democratic Equality, in which the children -- as forming the Majority -- are sovereign. insupportable in the household, they are sent to a Teacher. Of him, by a common call, Severity is demanded; and yet the very persons who -- knowing how much their need it, because they have never been used to it -- are loudest in the demand, prove, almost always, the first to revolt at Severity, apply it as cautiously and temperately as you may. Than Indiscriminate rigour, nothing is easier. It asks little beyond a rough temper and a narrow understanding. But that good Severity, which never tears up a Virtue, in eradicating a Fault, and which ever, in its very rigour, deals kindly with the young mind, is something less easy and trivial. It is of this sort that, in the present condition of things, there is need, to correct the manners and the minds of young people not really vicious, and in the main perhaps virtuously brought up, but spoiled by unbounded indulgence. If the tree of Knowledge once grew in a Paradise, it grows there no longer. A school is, necessarily, a place of some privation, and of many restraints. It ought not to give, and cannot affect, gratifications, which were better denied at home. But when children have never known constraint; when they are untried in any of those wholesome Hardships, amongst which Patience, Courage, Self-command, Perseverance, and all the robuster virtues form themselves, a system of proper Discipline becomes impossible, because intolerable to its objects. You must then apply, not the best laws, but the best that they are capable of receiving. Time, especially, must be given them, to lay aside their faults, and to put on virtue, in their stead. For these things, the Teacher must wait with the child, the Parent with the Teacher: and woe to either that shall, by a hot precipitation, cut short, in its very beginnings, the delicate and precious work, that demands so much circumspection and so many efforts! But Parents, neglecting what can never be so well done as at home, fling every thing upon the Teacher --- as if his business were so easy or unimportant, that gratuitous difficulties may be multiplied upon him, at pleasure. Now, to the mere mind, he may at once do good, by substituting a sound system for a vicious one. Upon the blank of neglected understandings, it will be his own fault, if he does not presently write something. But the chief affair --- the well-regulated conduct and Sentiments --- is not so easily set right, and will produce disorders, before you can correct it. If that has nothing done at home; of they come to him as ungoverned as they are untaught; with tempers spoiled and minds enervated by unacquaintance with Contradiction; animated with no generous wish, no elevated purpose --- with what pains, through what difficulties, must he lead them up to any Excellence! [A]nd how inadequate to his responsibilities the narrow stipend, for which he is often conceived the debtor, or something still more dependent, of his Patrons! The Principal is far less ambitious of a large, than of a well-regulated and happy school; and wishes no pupil that cannot come with teachable dispositions --- intent, not on Amusement or on empty gratifications, but on the great business of improving herself. For that, his school has always, he thinks, afforded scope, and will continue to do so. On the score of Prices, objections have sometimes reached him. Such are ill-founded. As Education of the same grade can no where obtained at a less cost. There is no multiplication of charges by indirect ways. Incidental expenses are very low. Dress (elsewhere a very havy one) is here no more, and often less, than at home. The unusual advantages of the place as to Comfort, and the use of excellent Mineral Waters, have not entered into the Prices. Wishing to give these rules a general circulation amongst those who are likely to be our friend either substantially, or indirectly, I take the liberty of addressing one to you, as a personal friend without asking to be understood, in the slightest . . . degree as lecturing. This, it is difficult to avoid the appearance of, even when they are far from designed to do so. Boteourt Springs, Va. Edward W. Johnston, P.M.